I am totally amazed at the way things work out sometimes. I never intended to write a blog. As of several months ago, I had never READ a blog... but, then, in August, everything changed. I started writing...and reading. It has totally blessed my life....from both perspectives. I never expected to develop friendships through my blog. Some of these are the very honest, "pull your covers", friendships that are truly precious in my life. They are the ones that challenge me to grow, to live honestly and continue to seek. These people are not afraid to ask the difficult questions, to confront my thinking when it is skewed, to call it like they see it - to hold up mirrors in my direction. From the blog reading perspective, I have been blessed with the stories and snippets of people's journeys that they have been willing to share. I have seen demonstrations of living by faith, of praising God in the midst of a storm. I have read of joys, sorrows, and absolute honesty. I have seen growth in the short time I have been following along. I have received strength and hope and insight through their words and pictures. 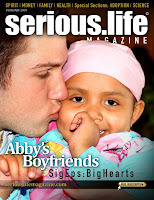 In reading about Abby, I learned that her parents own and publish a publication called Serious.Life Magazine. They just published the February issue today, and I am in their Featured Blog Directory. I really enjoyed reading through their last issue. I look forward to this one as well. The subscription is free, so take a minute to check it out and sign up to get future issues.